Push/Pull Helper. For clients with arthritis, limitations in finger function or sensory deficits. 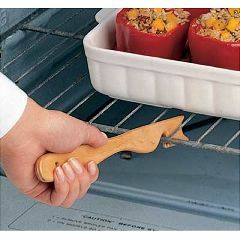 Lightweight, flat wooden stick with triangular notches is ideal for pulling or pushing oven racks or hot dishes. Twelve-inch length keeps the hand away from possible contact with hot surfaces. Latex free. Ease of use. Ease of use.